Coasteering is definitely an adventure and comes with a certain level of risk. Risk in the outdoors can never be completely eliminated. However, choosing the right Coasteering provider will ensure you have an awesome adventure whilst remaining safe. Tell their employees about the measures. Coasteering safety tips when choosing an activity provider…. Coasteering like all other Adventure Sports carries a certain level of risk and it is important that you make sure you are looked after should anything go wrong. As standard, you should expect your provider to have at least £5 million public liability. Celtic Quest Coasteering Limited has a comprehensive public liability policy with an Indemnity/ Benefit limit of £10 million. We are happy to provide a copy of our certificate should you need one. Most outdoor activity providers do not include include personal travel or accident insurance. We recommend you ask your insurer for details of the necessary cover for taking part in Coasteering. Bookings with Celtic Quest DO NOT include personal travel or accident insurance. Please ask your insurer for details of the necessary cover for taking part in Coasteering. Celtic Quest Coasteering Limited operates under English law. Do they have recently reviewed Risk Assessments? What equipment they will provide? Any professional Coasteering provider should provide you with a full length neoprene wetsuit, a well fitted helmet and buoyancy aid. It is usual for you to provide your own swimwear for underneath the wetsuit, a pair of old shorts (worn over the wetsuit) and an old pair trainers (worn in the water). In winter you should be provided with neoprene socks and gloves, some providers may require a deposit or hire rate. Check out our Coasteering Kit & Equipment guide. Can I Coasteer on ANY stretch of coastline? Land Owners Permission – The Pembrokeshire Coast National Park has a number of stake holders and a lot of the land is privately owned. Seasonal Marine & Wildlife restrictions – many stretches of the Pembrokeshire coast are affected by birds nesting, seal pupping etc. and must be avoided at certain times of the year. Safety – Members of the Outdoor Charter Group have agreed the locations suitable after extensive risk assessments etc. Ratios – current NCC guidelines recommend a ratio of 1 guide to 8 participants. Some providers work on much higher ratios allowing them to charge lower rates – this may have a negative impact on your Coasteering trip including not enough time in the water, lack of guidance & instruction, lack of safety supervision etc. Equipment – to provide all of the specialist gear for Coasteering it will cost anywhere from £100 – £200 per person. If your provider is cheap chances are the gear will be too. Testimonials and evidence – is your provider online? Do they have a website? Can you see photos and videos on their Facebook page and Youtube channel? Do they have reviews on Trip Advisor? These are all good measures of their credibility and will give you some idea of what you’ll get up to out there. You know what they say about paying peanuts? Monkeys aren’t hugely famous for their coasteering skills! Does the activity provider have any affiliations or accreditation? Many providers in the UK hold an Adventure Activities (AALA) license. An AALA license is a good indication of high health and safety standards. License holders undergo regular activity inspections and assessments of safety policies and procedures, including staff training and qualifications, equipment maintenance and safety checks. Coasteering is becoming an increasingly popular adventure activity throughout the uk, particularly in West Wales. 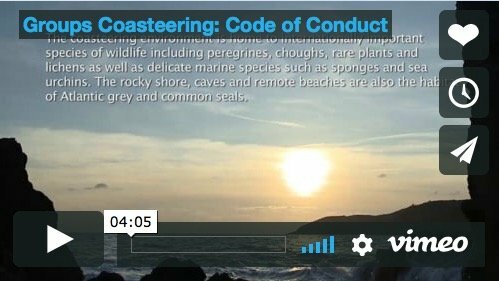 Coasteering guides and operators have a responsibility to look after the wildlife and environment of the coast. 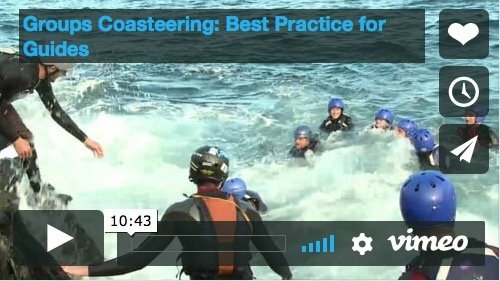 The Pembrokeshire Outdoor Charter Group has worked with coasteering companies in Wales, the National Coasteering Charter, and conservation organisations to make a DVD on best practice for companies operating in Wales. It is hoped that much of the best practice advice that has been developed by the POC group can be applied to wherever you take groups out coasteering.